Yesterday, I written an article on “Why new bloggers hate Google AdSense?” and we figure out that, it got strict terms and conditions, therefore new blogger hate AdSense. Secondly, sometimes Google penalty its users, when they start violating its rules and regulations. When we are talking about penalty, it’s like “Come to the principal’s office or fear of something” and even sometime consequences are far worse. This guide will help you to “recover from Google manual search penalty” if you have ever been hit with a manual penalty from Google. What is Manual Search Penalty? There are two types of SEO penalties “Manual and Algorithmic”. A Manual Search Penalty occurs, when a real human penalizes your site at Google, which causing you to be delisted, eventually you even lose your site ranking. SEOs experts call an “unnatural link penalty” for this type of penalties. On the other hand, Algorithm Penalty refers to a penalty that Google algorithm inflicts upon your site automatically. It is normally caused by SEO factors, which conflict with quality standards of the algorithm. The Algorithm Penalty will decrease or loss your site search engine ranking. How to know that my site has been Manually Penalized or not? The easy way to know about Manually Penalized is, if you’ve receive such kind of message from Google via Google Webmaster Tools. The message will look like this. How to Recover from a Manual Penalty? The manual penalty will not go anywhere magically unless you solve it. The longer time you take the longer your site will languish in penalty prison. Unfortunate, if you have been Manually Penalized, just stop doing other things. You have to clean up your site, fix 404s, start updating your blog, eliminate keyword stuffing, delete duplicate content etc. You have to work on removing Manual Search Penalty instead of improving onsite SEO etc. One of the main reasons behind Manual Penalty is due to “artificial and unnatural link pointed to your site”. To fix these toxic links you have to download links from Webmaster Tools. 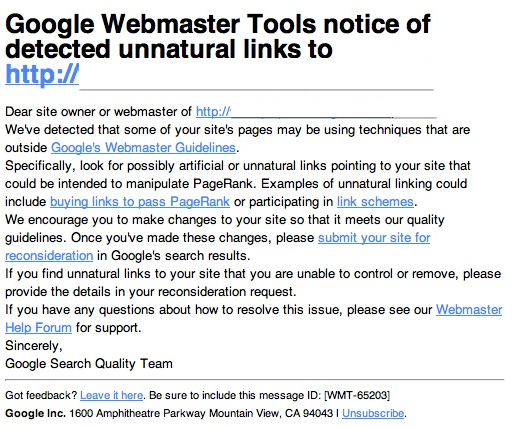 ü Sign-in to Google Webmaster Tools. ü Go to “Search Traffic”. ü Click “links to your site”. ü Click “More >> who links the most”. ü Click “Download latest links”. Now just destroy the offending links, which have been pointed to your site. How to identify low-quality backlinks? Now identify the domain authority of all links by using BULKDACHECKER, which allows you to check the DA of all links. ü Export all the links with corresponding DAs to Excel. ü Now copy the links to Google Drive. ü Just highlight the links, those DA below 25 and remove those links. However, if you trust a link whose DA is below 25, keep them, but be careful. ü Just create another tab with “Spammy Links” and copy every link, which are not highlighted. ü Review each site carefully and highlight each one that looks spammy. How should you find a site is spammy? ü Here you have to copy all the highlighted links “DA low than 25” and spammy and SEO violating backlinks. ü Now open a new tap and named it “link to remove” and paste on it. ü You have to visit all website one-by-one from where you have received a backlink. ü On each site, you have to find a contact “An Email ID”. ü Send request email, which include some wording like “We have discovered a link from your page (include their link) to our site (include your blog/website link), which may causing an unnatural link penalty from Google. I am in trouble please removing this link, I will be very thankful to you etc. How to Identify Fake Accounts in Facebook? How to Delete All Facebook Messages in 2 Steps? How to Add More Font Sizes in WordPress? How to Change Background layout on Facebook? Why Do New Bloggers Hate Google AdSense? How to Add Table of Content In Blogger?